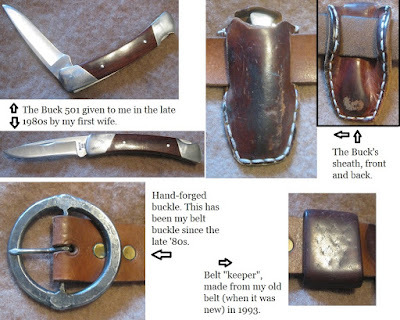 Kent's "Hooligan Libertarian" Blog: Gear post: Buck 501 and "odds and ends"
Gear post: Buck 501 and "odds and ends"
Finishing off the belt and its accessories. To begin, there's my Buck 501 lockback knife. This is really the only piece in this post that counts as "gear". My first wife gave this knife to me for my birthday sometime in the late 1980s. I've carried it pretty much daily since then. Only a year or so after I got it, a cow-orker borrowed it and tried to pry a button off a cash register and snapped off the tip. I forgave him but educated him on things NOT to do with a knife. I reshaped the blade and carried it in its damaged state until a couple of years ago. Then I sent it to Buck and got it repaired. Why didn't I do this sooner? The knife is small, but I've found it the most useful knife size for most everyday tasks. I love my Buck 110, but it's clumsy for a lot of the things I do, so I always go back to this one. This knife rides on my right side; the front-most belt accessory. Of course, every good knife needs a good sheath. Unfortunately, all it gets is this sheath I made for it when it was new. I have re-stitched it a few times over the decades, but it is still holding up. Then we have my belt buckle. It's hand-forged from iron in the mountainman style. It's slightly over 2.5" in diameter. I either got it in the late 1980s or the early 1990s (the more I think about it, the less sure I am). It's not one of those things I think about much, it's just there and dependable. I don't even remember where I got this buckle. Either at a mountainman rendezvous or through a buckskinner's catalog. It has outlasted at least 2 belts, and will probably outlast me. I suppose the belt should get an honorable mention, too. It's just a regular strap of unfinished vegetable tanned leather, 1.5" wide. Oiled occasionally (as are all the leather belt accessories). And that finishes up what's around my hips. Next? Maybe what's in my vest.